Spring break means vacation time for many families. Road trips, airplane flights, one day getaways -- however long or short the trip, spending quality family time together is a wonderful and good thing. But sometimes all that closeness can be difficult to handle. Next time you're wondering how you're going to survive your family trip, think about Ike LaRue, a poor dog whose vacation is anything but relaxing thanks to a pair of unexpected traveling companions, the neighbor lady's cats! My ship has sailed, and with it all hopes of a pleasant resolution to this unhappy saga. Traveling instead by car, we have left the coast far behind. I see now why the ship's captain, in his wisdom, refused to accept cats. The creatures simply do not travel well!" With a name like LaRue, you're bound to hit the road on a cross-country adventure at least one or twice in your life. 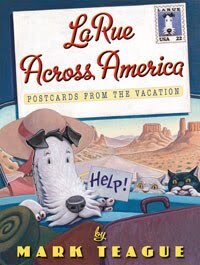 In LaRue Across America, the hilarious letter-writing pup, Ike LaRue is all ready for the perfect summer vacation -- a cruise to Mexico with his owner, Mrs. LaRue. Unfortunately, the neighbor lady ends up in the hospital and kindhearted Mrs. LaRue offers to take care of her two cats until she recovers. The cats aren't allowed on the cruise ship, so Mrs. LaRue decides that a cross-country vacation across America is a nice alternative. Ike, not at all excited about the car trip with two cats, writes a series of desperate letters to Mrs. Hibbins during the trip, urging her to "end the fiasco" and take her cats back. The group departs from Snort City, N.Y., and they stop in several states (New York, Connecticut, Ohio, Michigan, Wisconsin, South Dakota, Iowa, Missouri, Kansas, Colorado, Arizona) before reaching Death Valley, California, an unfortunate place to visit in the middle of July. LaRue nearly gives up hope for a happy end to a "terrible journey." Everyone that has endured a trip with bickering family members will be able to sympathize with Ike and the cats. The canine and felines fight over beds, cause disruptions at landmarks, and cheat at road games. Ike even pulls the "my side, your side" stunt by dividing the back seat with masking tape to mark territory. It's a classic cats versus dogs storyline, paired with some great illustrations by the talented Teague. All the images of the cats taunting Ike are super funny! The book is also a bit educational as the endpapers depict a map of the U.S. and provide a way for readers to follow the madcap escapade across the mainland. While some of the places they visit are real like the Empire State Building and the Grand Canyon, many of the destinations are entirely fictitious, for reasons unclear. As far as I know, Bazooka, Wisconsin, does not exist and neither does Pea Gravel, South Dakota. While the names are funny, I would have preferred that Teague showcase more actual sights across America. There are plenty of bizarre destinations like Witches Gulch in Wisconsin Dells he could have worked into the story. I realize it's only meant to be humorous, but it seems Teague portrays the Midwest poorly in the book calling the Great Lakes "fraudulent" and making a stay in Wisconsin sound less than desirable. 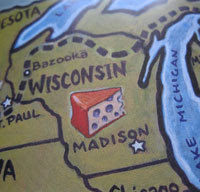 Plus, Madison, Wisconsin, is depicted a little too far east on the map in the book! Thankfully, Ike's clever, crafty letters are so much fun to read, it's hard to feel offended. That dog is quite an intellectual and a good dramatic writer, despite his selfish motives. Fans of the other LaRue series books will certainly enjoy Ike's newest adventure -- best for kindergarten on up. 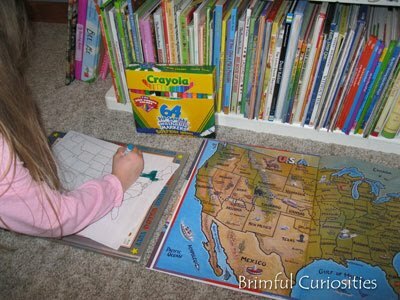 I printed off a blank map of America for my daughter to color in as we read the book together. In total, Ike stops in 12 states. 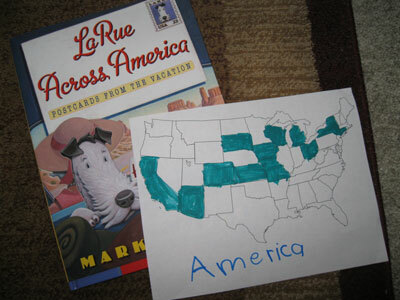 The book provided her with a fun way to explore our country and learn about the location of various states. Scholastic has graciously offered to give away (2) copies of LaRue Across America to two different readers. To enter this contest, leave a comment relevant to this post. Dog or cat fan? • Contest ends on Monday, April 4th, 2011 at 11:59 PM CST. dog fan, I love the first book in the series. We'd love this for our school library! So funny! I follow you already with RSS feed. Thanks! Tweeted you (I follow your tweets as my alter ego). I just wrote about LaRue's Detective book and we would love to read this one, too! Definitely a dog fan. THis would be a great book to use for this year's summer reading program (One World, Many Stories). We have both...but I'm a dog person! Thanks for the chance to win! I definitely prefer the puppies! If I won this book,I would read it to my preschool classroom. I subscribe via email! Thanks for the chance to win! I have to confess- neither. But, my 3 boys are all big dog fans. I am, however, a big fan of Ike LaRue. I'd love both a dog and a cat, my husband is strictly a dog person, but my boys are pretty enamored with cats, so for now, we have neither! Love the postcard book though! I follow via GFC! Thanks for the chance to win. My students would love this book. I follow on twitter and I retweeted about the contest. Mentioned it on my elementary blog and posted to my FB profile. Thanks again! Love your blog. I've added several titles to consider purchasing for our library. I'm a dog fan! Thanks for sharing this great book. My little man loves looking at maps and I'll have to check this book out for him! We are definately dog fans in this house. Froggy will tell you "cats make Mommy cough and sneeze" Poodles are the best. I'm definitely a cat person, but we love the other LaRue books! This one sounds like it's a great story as well! I am a dog fan. I'm a fan of both. In my younger years I had dogs and now I have cats. I love all animals equally I think. Fan of Mrs. Larue books - this looks great!!! I'm definitely more of a dog fan! BOTH! I have some of each. I have a overly rambunctious Golden Lab/Retriever named Lucy! Every day is an adventure with her and I wouldn't trade it for anything! I like them both but the animal dog would be my preference! What a great idea to keep the little ones occupied! I am definitely a cat fan. Already follow via GFC (Bornajhawk) and subscribe by e-mail. I used to be more of a cat person, but now I kind of am not a big fan of any animal. I live around lots of street dogs. Gross! I'm more of a cat fan I think.